ORMOND BEACH — Paramount Disaster Recovery offered its potential clients a deal after Hurricane Matthew: Sign over your insurance claim and we’ll take care of the rest. Property insurance can be a messy business, so Paramount found a willing customer in the Ormond Heritage Condominium Association. Overlooking the Halifax River, the three towers of the Ormond Heritage rise eight stories above the Granada Bridge. Its residents are mostly retirement age. Matthew left the buildings with a damaged roof, and water found its way into some areas on the ground floor. Instead of a speedy repair job, though, the Ormond Heritage is now engaged in a $66 million court battle with its insurance company, the London-based Ariel Syndicate 1910. Before the lawsuit, Paramount last year ordered residents to evacuate their condos because of widespread mold. The company said a section of the outside walls of every unit needed to be torn out and replaced. Many of the residents had trouble believing it. Paramount and the insurer are now fighting in federal court over whether the mold remediation is covered by the insurance policy. But the Ormond Heritage is already paying for its decision. The insurance claim from Hurricane Matthew now exceeds the condo’s coverage limit by $11 million. Due to one obscure legal provision — an assignment of benefits — included in the contract with Paramount, residents have lost the power to do anything about it. 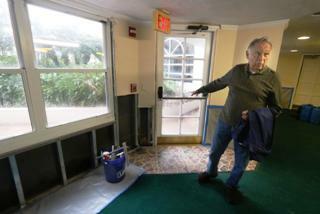 Ormond Heritage Condominium Association president Jerry Cutter gives a tour of the damaged Ormond Heritage Condominium which has been entangled in a yearlong legal dispute forcing residents to take some repair matters into their own hands Wednesday January 3, 2018. Florida law gives the insured the exclusive right to recover attorneys fees when a policy dispute is taken to court. It was intended to give a boost to consumers who go head-to-head with deep-pocketed insurers. By having customers sign over the rights to their policy, namely the right to sue the insurer, service providers like Paramount have added a powerful tool to their arsenal of negotiation tactics. Once an assignment of benefits is done, the vendor can assume the rights of the individual and force insurers to pony up more money or risk spending large sums on litigation. The arrangement leaves the insurer on the hook for all attorneys fees and the final cost of the claim if they lose. Lawmakers, regulators and reform advocates have been sounding the alarm out of fear these types of cases will spread throughout the state. It’s become a major topic of concern in the property insurance world as the number of legal cases where a third party invokes the assignment of benefits has climbed four-fold in the past seven years. They now make up more than half of all lawsuits filed against insurers, said William Large, president of the Florida Justice Reform Institute, which published a report on the issue last year. “One call, we do it all” is how Paramount Disaster Recovery markets its services. Paramount focuses on property mitigation and restoration work and is run by Francis “Frank” Buchanan, a Scottish immigrant whose first taste of the industry was as a roofing day laborer. Buchanan now holds a contractor’s license with numerous construction-related businesses in his name. But it wasn’t Buchanan who made the pitch to the Ormond Heritage. It was Joseph Radcliff, a seasoned salesman, who authored a book on how to make money from home insurance restoration. Radcliff won a $16.9 million judgment — the largest defamation award in Indiana history at the time — from the insurance giant State Farm. He emerged from the case, which included allegations of fraud against him, as someone who brawled with big insurance and won. In the past two years at least, Paramount seems to be bringing the same kind of fight to various Florida courtrooms. Since 2016, Paramount Disaster Recovery LLC has filed 68 lawsuits against insurance companies. Each of them involved clients — many of them in Martin County — who signed assignment of benefits agreements. Buchanan, when reached by phone, dismissed questions about whether the number and frequency of the lawsuits filed by his company represented the type of abuse some have complained about. Less than two weeks after Hurricane Matthew scraped Florida’s east coast in October 2016, Dr. Frank Farmer, a former state surgeon general who was the Ormond Heritage association’s president at the time, signed the contract with Paramount. Six months later, in April 2017, condo owners were summoned to the complex’s downstairs ballroom over the PA system. They were met by the condo association attorney at the time and Radcliff, a representative with Paramount Disaster Recovery. The condo association had hired the South Florida company to handle apparent roof damage caused by Matthew. Now, Radcliff told them there was mold, possibly toxic, that could be affecting every condo in all three of the buildings. Jerry and Cecillia Cutter, longtime residents of the Ormond Heritage, slipped into the room after a neighbor mentioned the gathering. Safety masks were placed on a table inside the lobby. Everyone present was told to evacuate right away. Farmer, the association president and once the top public health official in the state, warned residents again in a memo. “Please be advised that you will be placing your health in jeopardy, if not severe jeopardy, if you remain in your unit (i.e. fail to vacate it) given the elevated levels of Stachybotrys, or other unsafe levels of mold spores, that currently exist in your unit,” Farmer wrote in a letter dated April 25, 2017. Another meeting was held in May 2017. The message spread throughout the buildings. Many of the residents, including the Cutters, were skeptical of the mold claim. They wanted to see the test results with their own eyes. It took the Cutters two months before they saw the report. Air Quality Assessors of Florida, based in Winter Park, found high levels of a common mold type on the first and second floors of the front lobby. Two walls inside a nearby office also had increased levels of mold because of water exposure, according to test results provided to The News-Journal. Most, if not all of the units were tested by the same company. Residents said they often returned home to find an entire section of their living room cordoned off with plastic and tape. Sometimes holes were drilled into the ceiling or floors and an exhaust fan was left inside, but turned off. The results varied widely. About one-third of the residents had their units re-tested independently, according to Jerry Cutter. Many of the common areas, including the ballroom where the meeting was held, were closed off afterward. A security guard started screening visitors at the front door. Some, including Farmer, left within weeks. But many of the residents stayed. The condo had already paid Paramount its $960,000 deductible up front. But Paramount didn’t like the price to fix the roof quoted by Ariel, the condo’s insurance company. Blue tarps covered the roofs for months as the two parties were deadlocked. Although the first lawsuit filed last June in Volusia County Circuit Court lists the Ormond Heritage Management Association as the plaintiff, representatives of Paramount were actually behind it. The grounds for the legal claim against Ariel, like many of Paramount’s other cases, was breach of contract. Signing over the benefits left the Ormond Heritage Condominium Association powerless in the fight. They’d handed over their right to negotiate with their own insurer. Stuck on the sidelines, some residents seethed at those responsible for hiring the company. A recall petition was started to remove Farmer from his position. He resigned days before the vote. The Ormond Heritage isn’t the only area property to have signed its benefits over to Paramount. Vacant since Hurricane Matthew, the Maverick, a 138-room timeshare resort on State Road A1A in Ormond Beach, still has a Paramount Disaster Recovery trailer parked out front. The hurricane left its patio in shambles and a large section of the roof was blown off. To make matters worse, a pipe burst in the kitchen right before the storm arrived. Most of the damage to the Maverick was obvious to the naked eye. Curtis Cole, the Maverick’s general manager, felt like they were being low-balled by their insurance company. A number of public adjusters and contractors were already speculating in the area. Cole kept the stack of brochures they’d leave behind. “We signed with both and didn’t realize that the assignment of benefits was actually not our friend,” Cole said. The agreement was inked on Nov. 1, 2016. Paramount also found a “moisture” problem at Maverick and had torn out many of the cabinets in the studio apartments and some of the walls. The first deadline for completion of repairs was at the end of January 2017. January turned to February, and then March, April, May. Paramount was locked in a battle with the Maverick’s insurer, ICAT. Although no lawsuit has been filed against their insurance company yet, Cole said the Maverick is now looking to hire a new contractor and pay for it out of pocket just to be back in business. Paramount has already been paid at least $3 million from the Maverick’s insurance company, Cole said. The roof work is complete, but many of the individual rooms are still unfinished. Assigning the rights to an insurance claim is a 100-year-old practice in Florida that researchers say only became popular in the last decade. The prevailing theory is that vendors and attorneys became more aware of the tactic and began deploying it with force in the vehicle and property insurance market. “Maybe a handful of individuals figured out that they could take first-parties coverage and do the same thing as in (car insurance),” said Ashley Kalifeh, a co-author of the Florida Justice Reform Institute report. The study showed that most of the legal activity is concentrated among a small cadre of vendors and attorneys. “Once someone figures out a new way to do things, all the other lawyers see it and other vendors see it and it just gets mimicked,” she said. For those schooled in the ways of property insurance, third parties seeking the best deal for their clients is really no different than if a consumer takes the insurer to court. A partner with the law firm Hale, Hale & Jacobson in Orlando, Jacobson and a handful of other attorneys were identified in the Florida Justice Reform Institute report for handling a high volume of lawsuits involving assignment of benefits. He doesn’t doubt the number of assignment of benefits lawsuits has risen sharply and said there’s room for some “common sense reform.” Yet, he isn’t sympathetic to the lament of the insurance industry. “What insurance companies don’t like is they’re able to bully homeowners around inside litigation,” he said. Meanwhile, insurers are responding by raising rates. Insurance companies like Universal Property & Casualty and the state-run Citizens Property Insurance Corporation are raising rates, at least in part, because of increased litigation from the assignment of benefits. Citizens has said it would have to raise rates by 10 percent every year if the pace of litigation doesn’t slow down. Some say it’s only a prelude for what’s to come. Until recently, Floridians dodged major storms for a decade. The time allowed insurance companies to take advantage of lower reinsurance rates so the “damage” of the increased litigation was “muted,” said Jeff Grady, president of the Florida Association of Insurance Agents. “You haven’t really felt the full effect of what it might be like,” Grady said. A report published by the Florida Office of Insurance Regulation showed that the severity of water loss claims, on average, were about one-third higher when an assignment of benefits was involved. Regulators are looking to lawmakers for a change. However, attempts at reform in the state Legislature have all sputtered. One bill passed in the Florida House last week that would allow property owners to rescind the agreement within seven days of signing a contract and enforce other restrictions. Hukill is sponsoring a bill that would rewrite how assignment of benefits is used in the state. The provision so SB 62 would place require policyholders to notify their insurance company when signing and assignment contract, among other things. An identical bill didn’t get a hearing during last year’s session. Nevertheless, she said the need to protect consumers is still urgent. “Too many people don’t realize that when they sign the assignment of benefits they are going to be out of the loop,” Hukill said. The case of the Ormond Heritage took a turn last summer. The insurance company Ariel Syndicate 1910 went on the offensive, filing a lawsuit against Paramount in the U.S. District Court for the Middle District of Florida. The legal complaint asked a judge to clarify how much insurance Paramount, “the purported assignee” of the insurance claim, was entitled to be paid. Ariel’s lawyers disputed owing money for just about everything except the roof, which they argued should only be paid after the work is complete. Paramount alleged the company was acting in “bad faith,” and Ariel countered by asking a judge to dismiss the case. The back and forth continues with no end in sight. Meanwhile, residents at the Ormond Heritage are living under a legal cloud. Most of Paramount’s clients who landed in court were individual property owners, not 158 in three condo towers. Residents were so skeptical of Paramount’s claims of mold and concerned for their health that many paid for their own air quality tests. Now there are various reports that conflict with the one completed by Air Quality Assessors, said John Oliva, another condo association board member. “All of them have been conflicting with it,” he said. What the residents didn’t know was that the Winter Park company was also singled out for its frequent involvement in assignment of benefits cases, according to the Florida Justice Reform Institute report. Since 2014, Air Quality Assessors has been a vendor in more than 500 assignment lawsuits, the report states. When reached, Richie Kidwell, the owner Air Quality Assessors, said the tests aren’t “apples to apples” and that his company was still owed more than $100,000 from the Ormond Heritage tests. The condo’s new board, elected over the summer, has reopened many of the downstairs common areas that Paramount had closed off to residents. A new air quality report by a local company showed no signs of harmful mold in most places. Where there was water damage, Jerry Cutter and the building’s manager were busy one recent day doing the work of replacing pavers and walls themselves.